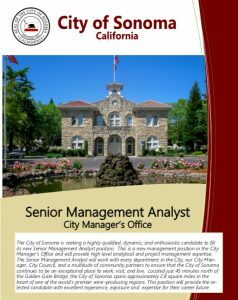 The City of Sonoma is seeking a highly qualified and dynamic candidate to fill its new Senior Management Analyst position. The Senior Management Analyst will report to the City Manager and will provide responsible professional, administration and technical assistance in the development, administration and implementation of City programs and projects. This position will provide highly responsible, analytical staff assistance and conduct specific complex, difficult and comprehensive analyses of a wide range of municipal policies involving organization, procedures, finance, budget and service; manage various projects and initiatives for the City; and assist in general management functions. The Senior Management Analyst will work with every department in the City, our City Manager, City Council, and a multitude of community partners. With a population of 10,989 and located just 45 minutes north of the Golden Gate Bridge, the City of Sonoma spans approximately 2.8 square miles in the heart of one of the world’s premier wine-producing regions. A typical candidate will possess the equivalent to a Bachelor’s degree from an accredited college or university with major course work in public administration, business administration or a related field. A Master’s degree in a related field is highly desirable. The annual salary range for the incoming Senior Management Analyst is $82,073 to $99,760 DOE. If you are interested in this outstanding opportunity please submit a cover letter, application and comprehensive resume electronically to: City of Sonoma – Attention Cathy Lanning, Administrative Services Manager, clanning@sonomacity.org by April 26, 2019. See a detailed recruitment brochure.